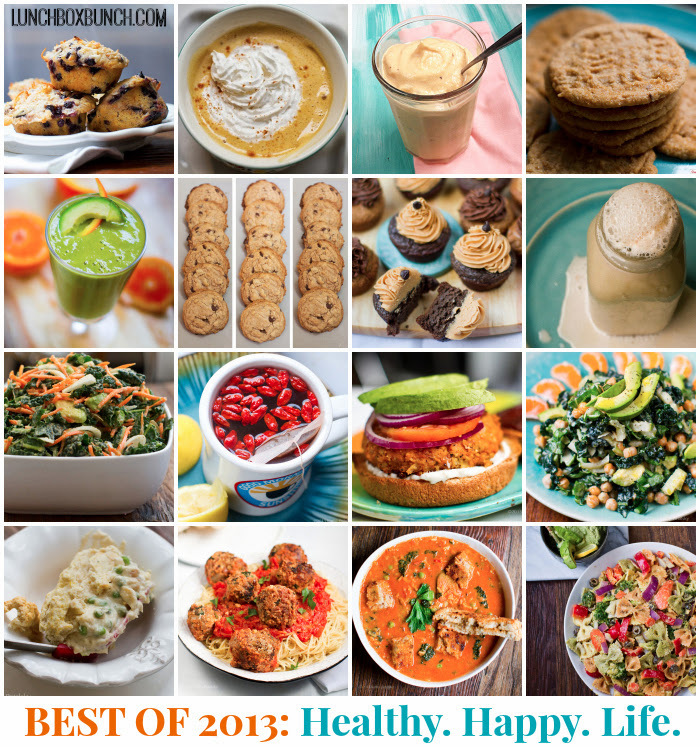 Best of 2013: Top 25 Posts on HHL! Lets take a look at my 2013 memorable moments and HHL's Top 25 Posts of 2013.. Someone once told me that once you hit your thirties, everything in life speeds up. I will be 33 in January and I am so proud of every single year I have spent in this world. And 2013 was a year where everything DID seem to speed up for me. For me it was a memorable year for some very happy reasons and some sad ones as well. But in between all the craziness of life, for better or worse, I was always in the kitchen. Always ready and eager to whip up healthy, happy vegan dishes to share with you guys. I am so thankful and happy for all the comfort food meals, homemade dinners, wellness smoothies and lunches and bright and sunny brunches that 2013 brought me. Food is intertwined in life, so why not make it amazing, uplifting, healing, energizing and happy. So as I look at my year in review, I always love to look at the food I created and enjoyed too! * My Book. My First Book was Published! July 2nd 2013 365 Vegan Smoothies - order your copy now for a healthy smoothie-filled New Year and 2014! And thank you to everyone who has purchased my book, my publisher Avery, my agent Holly and every blog reader who has been so supportive of my book release. I am SO very proud of it and so glad you guys love it! * FV. My other site FindingVegan.com had a serious boom in popularity. It has reached over 92,000 likes on facebook and has become a go-to spot for vegan recipe sharing online. I am so proud and happy to have started this amazing community of vegan bloggers and vegan curious recipe seekers. * Nelly. As you all know, I am still getting over the very sad loss of my best friend and best kitty, Nelly. I am still healing. The wounds are still quite tender, as I realized last night in church when I couldn't help but start crying when all my favorite Christmas songs were sang. O Holy Night, Silent Night and Hallelujah, and suddenly I was tasting tears. It struck me by surprise and also reminded me that my heart has been forever changed. And now it is just up to me to choose a path of joy, as a tribute to sweet Nelly. But tears are a part of that. I chatted about that in this post. My husband and I have been avoiding a "normal" Christmas this year in exchange for a low key holiday. We even made a truce that we wouldn't buy any wrapped presents this year. Instead we have donated to a few of my favorite animal charities, in Nelly's name. I was very hesitant at first to share this journey and experience online, but sure enough, sharing this experience has been a blessing in disguise. The conversation we have started about pet cancer awareness and pet loss is one I will hold with my forever. It has truly forever changed the way I live each day in this world, I want to thank you all for being there for me and sharing your stories with me. 1. Five Step Raw Kale Salad - Yup, kale takes the lead spot. Is anyone surprised? Not me! Kale for the win..
2. BBQ Peanut Sweet Potato Burgers - This feisty sweet potato burger is a go-to comfort meal. 3. My Big Guide of Vegan Protein Powders - For all those smoothies you will be blending in 2014... add some vegan protein! 4. Cookie Tips + My Best Cookie Recipe - Oh goodness these chocolate chip cookies make me swoon! 5. 33 Potluck Perfect Dishes - I guess you guys like to party... and share food when you do! Good for you. Good food was meant to be shared. 6. Warm & Chewy Peanut Butter Cookies - Peanut butter cookies, a favorite of all, gone vegan. 7. Rustic Kale , Rice & Tomato Comfort Stew - This comfort soup was one of my favorites of the year. Tomato rice soup... yum. 8. Fall Oatmeal Pumpkin Bread Loaf - Pumpkin lovers, dive into this cozy loaf. 9. Creamy Baked Potato Soup - My husband's favorite. Creamy soup with loaded baked potato flavor. Gone vegan! 10. Vegan Carrot Cake with Cream Cheese Frosting, Gluten-Free - Healthy carrot cake. Breakfast approved in my book! 11. Chocolate Avocado Mousse - Creamy chocolate meets silky avocado. 12. Veggie-Loaded Avocado White Bean Salad - I adore this lunch-perfect open-faced sandwich recipe! A must try..
13. Lemon Tea: What I Drink Every Morning - Yup, every morning..
14. Green Tower Power Salad - This salad will win you over I am sure of it! I meal on a plate, or bowl! 15. Spaghetti & No-Meatballs - The classic gone vegan. 16. Hot Pumpkin Mug - Oh I adore this cozy golden mug! Try it! 17. 15 Go-To Vegan Salad Dressing Recipes - Your greens need some fantastic dressing on top.. here are plenty of go-to recipes! 18. Creamy Cashew Pot Pie - LOVE this one.. comfort food. 19. Sweet Citrus Avocado Dreamboat Green Smoothie - Green smoothie time. Sweet citrus and greens. 20. Avocado Pesto Pasta - Pesto with avocado and plenty of veggies built in. 21. Secret-Ingredient Healthy Vanilla Shake This secret ingredient will make all your shakes frostier! 22. Homemade Almond Milk: 3 Recipes - If you do one thing in 2014, make your own almond milk! A must-try for every person, like, ever. 23. Peanut Butter Chocolate Cupcakes - Dessert perfection to me. Chocolate meets peanut butter via a cupcake. 24. 6 Summer Slaws to Try - Some sassy, slaws to try. Crunchy salad, zesty flavors. 25. Double Coconut Blueberry Muffins - And these. Muffins. Blueberry muffins. With gobs of coconut. Bliss.